Step 1: Select selling strikes using the "Price Trajectory" chart from Ez Stock Analyzer. Price Trajectory chart allows you to set the initial probability based on the risk tolerance level that you would assume in your building of a trade. Prior to an earnings announcement, when a stock's implied volatility is rising, we recommend using a 90% probability level. Outside of an earnings period, our recommendation is the probability level should be reduced to 80% - 85%. After setting the probability level, the expiration date should be defined. For earnings based trading, we recommend the closest date to the after earnings announcement date. If weekly expiration dates are available, then the next expiration date after the closest one could also be checked. Your projection period should be set up to cover selected expiration date. When all settings are complete, begin to select expiration date on the chart. In the pop-up window, you will see Upper/Bottom band for price trajectory. These prices indicate that based on historical analysis, price of the stock with selected probability would not move Above/Below these prices (respective to the band). Prior to an earnings period, the orange lines are based on historical analysis of the last 5 years. The green lines depict historical analysis of the earning period. Upper/Bottom prices define selling strikes for Spread, Iron condor or other strategies, where stock price should not reach selling strike on expiration. As it can be seen from the price trajectory chart, there is 90% probability that on Friday, May 18, 2018, the Upper/Bottom Earnings based prices would not reach $89.84 / $80.13 respectively. This allows you to build Iron Condor by selling $80 Put strike and $90 Call strike. To minimize risk in this case, we used a $2 spread by buying $78 Put strike and $92 Call strike. After making selection in the Option Matrix, click on "Analyze Trade" button. Result table depicts multi-prong approach to assessing probability and mitigating risk. Multiple charts are available to visualize probability analysis. None of these probabilities are better than another. Yet, if they are all lined up, then it is giving you a competitive advantage through a more comprehensive view on your risk assessment. Closing price for WMT on May 18, 2018 was $83.64. 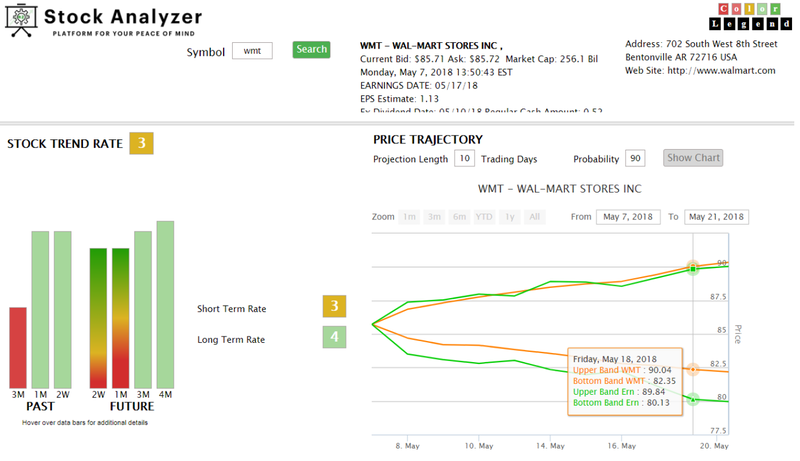 It means, as it was predicted, WMT price ends up between selling strikes, which provides a 42% ROI in only 11 days. There are two major components to Probability based trading: Probability and Return On Investment. For one to accurately mitigate the risk associated with a trade the first have to properly calculate the Probability of profit. Current methodologies of calculating probability are based on an assumption that stock prices are normally distributed. However, our research shows that this is not true in most cases. For more on this read Probability Arbitrage. Ez Trading Platform uses a multi-pronged approach to probability. As it can be seen in our 3-Step-System we calculate 9 different probabilities that give our customers a more in-depth view on the risk associated with a trade, as well as better expectation of the final results. Let's take a look at how ROI value can be looked at from a probability based trading stand point. Traders should interpret ROI value as follows: Each lost trade will wipe out profit of 100% / ROI. In our example above ROI has a value of 42%, so each lost trade will wipe out 2.5 profitable trades (100% / 42%). Proper correlation between Probability and Return On Investment. Probability based trading requires consistently building trades that are not only have a high probability of success, but also have a certain potential ROI. Only a proper correlation between Probability and potential ROI will make your overall trading profitable. Not paying attention to the correlation between Probability and ROI is a common reason why most traders, even those who are selecting trades with a 80% probability of profit, end up losing money. 80% probability can be interpreted as out of 10 trades you are more likely to get 8 winners and 2 losers. If for each of these trades your ROI was 17%, that means your 2 loses will wipe value of approximately 12 profitable trades (2 * 100 / 17). Your overall profit after 10 trades would be close to (-4) trades. If your average investment per trade is $2,000 and potential profit is $340 (17% ROI) then your loss after 10 trades would be on average ($1,360). That is why correlation between Probability and ROI is so important! WMT trade that we described in our Step-by-Step analysis above has overall 90% probability of success and ROI of 42%. Statistical interpretation of this trade is that if we will take 10 similar trades, we will win 9 times and lose 1 time. According to ROI this one lost trade will wipe 2.5 profitable trades, which will leave us with net 6.5 profitable trades. Check examples of the trades in a "Trades Report" that we built using 3-Step-System. If you analyze this report almost all of the trades have probability close to 90% or above and ROI on average between 17% and 20%. This can be interpreted as 1 loss that statistically can occur in 10 trades will wipe out 5 or 6 profitable trades, leaving us with net profit of 3 or 4 trades. How you can trade out of $25,000 options trading account. Set up your investment cap for one trade at $2,500. You can achieve this by selecting the appropriate number of contracts per trade. This will allow having at least 10 open trades at any time. If you look into number of days till expiration in the above "Trades Report", you will find out that average length of built trades is less than 14 calendar days. This allows 2 round trips per month for each investment per trade, which amounts to 20 completed trades per month. These 20 trades should net approximately 6-8 profitable trades. 17%-20% ROI on $2,500 investment indicates that your average potential profit per trade is around $450. Let's low our expectation and assume that instead of 6-8 net profitable trades per month you will have only 4 or 5 net profitable trades. It gives on average around $2,000 net profit per month or $24,000 per year. This is an almost 100% return on $25,000 account and does not include profit reinvestment opportunities. If your account is different from $25,000 that we analyzed, you can adjust either investment cap or number of taken trades. Remember that we are discussing probability based on statistical analysis; and if you are taking only a few trades probability analysis can be substantially skewed. There are over 4,000 optionable stocks. Our 3-Step-System depicts methodology of building trades. You can apply it to any stock you want to analyze, but we also recommend checking our "Trading Ideas" service as a starting point for the search of the best candidates for the 3-Step-System.